As we tend to the needy, we might send instructive birthday greetings to William Sanford “Bill” Nye; he was born on this date in 1955. 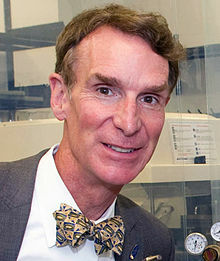 A mechanical engineer turned actor, science educator, and television presenter, he is best known as the host of the PBS children’s science show Bill Nye the Science Guy (1993–1998), and for his many subsequent appearances in popular media. Nye was greatly influenced by Carl Sagan, with whom he studied astronomy at Cornell University. He began his career with Boeing, in Seattle, designing hydraulic systems, from the early to mid 1980s. From 1986-91, he created and developed the Science Guy persona for local radio and TV, while eking out a spartan existence as a stand-up comedian. But in 1992. he made a pilot program for the local PBS station, attracted underwriters, and launched what became a five-year national PBS series, Bill Nye the Science Guy. Since then he has appeared in other TV science programs and as a guest expert on TV shows, continuing his quest to make science accessible to the public. He currently serves as CEO of The Planetary Society.